Saturday Morning Footy is ten years old in 2016! The big year begins Saturady March 19 with the 2016 Eagles Open Day. The Open Day will take place at Long Bridge #3 (Crystal City) in Arlington VA.
Open Day begins at 9am SHARP. The session will run for 90 minutes and will include fun and safe games for boys and girls aged 5 to 15. The session will end with a non-contact match. No experience necessary! This is a great opportunity to bring friends and neighbors out to enjoy the Spring day learn about the great game of Australian football. Registration for the 2016 season is open. Click HERE to register. OPEN DAY FLYER HERE (PDF). *From the kids menu. As we blast past the eight days of Hanukkah, I was thinking about Adam Sandler’s Hanukkah Song and that we need something similar for footy. There are many people out there that are well known to Americans but Americans don’t know that they used to play footy or are big footy fans. I can’t write music or sing, but here is my attempt to rectify this great wrong. Ben Simmons is being talked about as the next Kobe Bryant, but before heading to Beverly Hills he laced up his footy boots for the Beverly Hills Junior Football Club in Melbourne’s eastern suburbs. 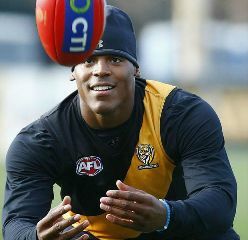 He will join other former footy players in the NBA including the Cavs' Delly and Golden State’s Andrew Bogut. The Spurs Patty Mills could have been a star in the AFL, but Collingwood’s Pendlebury gave up his spot at the AIS to Mills and the rest is basketball and footy history. Michelle Timms had a Hall of Fame career with the Phoenix Mercury, but played footy growing up. LA Spark, Erin Phillips, just announced she will play for Port Adelaide, where her dad played his footy. Consider donating to the Washington Junior Australian Football Club to create more names for future songs. You can donate HERE. 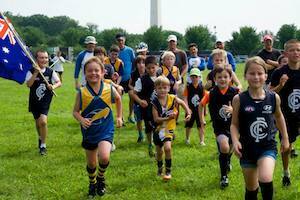 The 2015 Saturday Morning Footy Winter Camp will be held at Virginia Highlands Park in South Arlington on Saturday December 5. The clinic will begin at 9.30am (NOTE THE LATE START TIME) and end at 11.00am. The program is free for boys and girls aged 5 to 18. If you have not registered for the 2015, do so HERE. 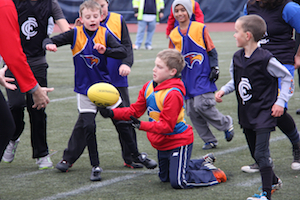 Under 9s - boys and girls aged 5 to 8 will be participate in AFL Auskick style clinic. They will play fun games and activities aimed at teaching the skills and rules of Australian football. The session will end with a non-contact game followed by snacks! Under 15s - players 9 to 15 will spend a few minutes on skills before going into a pick up non-contact game. 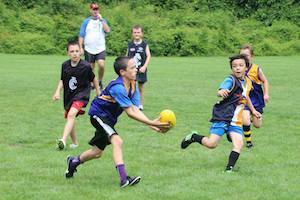 No experience is necessary with an emphasis on fun and learning the skills and rules of Australian football. Eagles Academy - The academy session is for high school aged players. Participants will work on skills with the BW Eagles and help with the coaching of the U15s and U9s. The 2015 Fall Camp will take place this Saturday at Lake Fairfax Cricket Ground. The camp is free. Boys and girls aged 5 to 15 will take part in fun and safe games and activities. These activities will teach the rules and skills of Australian football. The session will end with a non-contact game. Snacks will be provided. The camp will be followed by the EAFL Tournament with teams from New York, Boston, Philadelpha and Washington participating. If you have not registered for the 2015, REGISTER HERE. 2015 saw our tenth summer of footy and one of our best. Across the summer, we had 84 children participate in the program. The total is 35 more than we had in 2014 – and our 2nd best total in the 10 year history of the program Participants ranged from 5 years old to 16 years old, with an average age of 9 years old (we had roughly equal participation of those ages 5-9 and those ages 10-16), 20 of our participants (nearly 25%) were girls. On a weekly basis, we averaged 40 participants (10+ more than last year). Our most well-attended session saw 60 children participate. While the numbers are great. It was also great to have awesome coaches and volunteers helping us out. Thank you to everyone who helped out coaching, taking photos, cooking hotdogs, running registration, washing uniforms and bringing snacks. 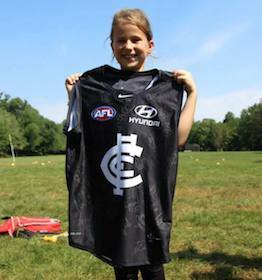 We are very grateful to the support we received from the Carlton Football Club and Transurban. Our 2015 raffle winners took home two great prizes, a signed Carlton jersey and tickets to see the Nats play the Phillies.